Very Good. 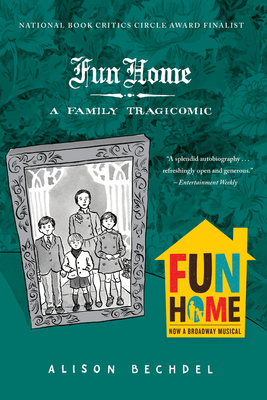 Fun Home: A Family Tragicomic by Alison Bechdel, 2007-06-05. Trade paperback (US). Glued binding. 232 p. Contains: Illustrations. Intended for a young adult/teenage audience. Fair. 0618871713 PLEASE READ! This book WILL contain heavy wear, excessive highlighting/writing, loose binding, AND/OR water damage. Supplemental materials such as CDs or access codes may NOT be included regardless of title. Contact us with any questions! Good. Cover and edges shows wear. Pages are clean and intact. Very Clean Copy-Over 500, 000 Internet Orders Filled. Bechdel is an amazing graphic novelist--in Fun Home, she showcases all of the idiosyncrasies of family life while developing characters that are real rather than (ironically?) cartoonish as one might expect in a graphic novel. never a devoted fan of DTWOF, she won me over in this wonderfully sustained narrative about an artist in a house full of messed up artists. At the core of the story is her attempt to come to terms with her talented, distant father----a study in contradictions, emotional selfishness and sexual confusion. The artist has much rich material to mine here, and she is fully up to the task. Her confident illustration style and storytelling gifts combine to make this one of the best graphic memoirs around.